CobbleStone Software provides contract management software to automate and streamline the contract process with a user-friendly, web-based platform. 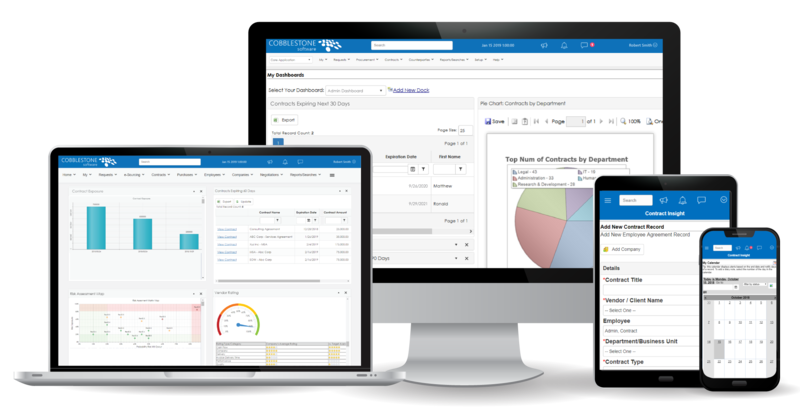 Contract Insight Enterprise has been selected by thousands of users to automate contract requests, approvals, workflow, authoring, searching, reporting, and more with an application that is built for contract professionals and enhanced with artificial intelligence. Key customers: Please contact CobbleStone for client reference details. Full contract lifecycle management including: contract repository, email alerts, calendar notifications, contract authoring, workflow, eApprovals, electronic signatures, contract compliance, vendor management, financials/budget tracking, performance ratings, artificial intelligence, machine learning, searching, reporting, user dashboards, integration with leading systems, eSourcing, user-defined fields, and much more.